If you purchase an item through affiliate links within our content, we will earn a commission at no cost to you. As an Amazon Associate we earn from qualifying purchases. See our disclosure policy. An outdoor mister is not a new idea, but we sure didn't know you could get them for your porch until a friend told us. Misting systems have been around for hundreds of years. Remember the Roman fountains? Moving water through hot air reduces the surrounding temps. See our layman's explanation below. You can drop the temperature on your porch, deck or patio up to 25 degrees on the hottest day by using a simple system of tubing, fittings, and your garden hose. Mary and I are pretty tempted to try an outdoor misting system this summer. Imagine how much cooler you'd be on your porch with a cool water mist. Depending on your geographical area, relative humidity, and water pressure, your results may vary. However, an outdoor misting system will cool the air substantially and is a worthwhile investment for your comfort and home. Installation looks easy on the models we've researched. 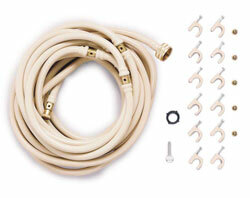 If you've ever run cable for your TV, attached tubing to railings or connected your garden hose to a faucet you can install an outdoor misting system - it's pretty easy! Smarthome.com has misting systems plus other neat home automation devices. Just use their handy search tool and type in "misting systems. Residential water pressure normally ranges from 35 psi to 90 psi; a minimum of 45 psi is needed for most misting systems. People with well water normally have their pressure set at 45 psi which is adequate to operate the misting system. Outdoor misting systems do not seem to work well below 45 psi; the water particles are too large for effective misting. Because Mary and I once lived on a rather large hill we had to install an additional water pump to increase our water pressure when we moved in. We had a great view! No problem if you don't have a patio, porch, or deck. If your home is exposed to the hot sun, you can attach an outdoor misting system along your roof line locating it above your exposed doors and/or windows. The mister would cool that area and reduce your overall air conditioning costs! Live in an apartment or condo and have a balcony? They make diverter valves which can connect to your kitchen faucet and allow you to use the misting system on your balcony! Want a misting system for your yard? No problem. Build a frame from pvc, use either buckets filled with sand or purchase two umbrella stands, and use a frame misting system designed for this purpose! Where there's a will, there's a way! The only cost, other than the system itself, is perhaps a gallon or two of water per hour. That's quite a bit less than running your air conditioning system for the same period. If you have hard water you will need a special filter (we found one called a lime reduction filter); otherwise, your lines will become clogged very quickly. Likewise, if you have a lot of sediment in your water lines, you will need a special filter as well to preclude clogging. Ready for a lesson in thermal dynamics? OK, didn't think so. Here's a layman's explanation. Water uses energy (heat-hot exterior air) to evaporate (600 calories of heat per gram of water if you recall from your science class). Misting systems force water through very small openings creating a fine mist of very, very small water droplets (actually smaller than the diameter of a human hair). Once the water hits the hot air it quickly absorbs the "heat" for evaporation (called flash evaporation - ah, that science class!). Reducing the heat obviously reduces the temperature (up to 35 degrees Fahrenheit). That's why you will feel cooler by using an outdoor misting system. It's also why you feel cooler at the beach, waterfall, fountain, or lake on a hot day. You also get some other advantages; outdoor misting systems clean the air of dust, pollen and smoke and they repel flying insects as well. Told you misting systems were pretty neat. Will it Work on a Really Hot "Sticky" Day? Good question, that hot "sticky" day is actually the humidity in the air. 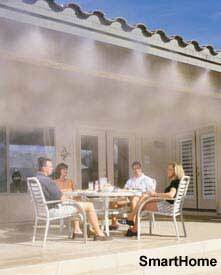 Outdoor misting systems cool the air best when relative humidity is below 80%. What's great about outdoor misting systems is that relative humidity is lowest when the temps are highest in most areas. We are fan fans - no pun intended; we use them all the time and even take one when we travel to use in our hotel room. Have a pet? Pets can become victims of heat exhaustion just like people. To keep them cool, use a pet misting system. For the love of birds! You got it - there are misting systems for the birds. Better than a bird bath because you don't have to clean or maintain it. You can attach these to tree branches or lay it in the grass- the birds will love it. And believe it or not, we even found misters for golf carts! Photos courtesy of saschaaa, law kevens and jdanvers.